In July 1783 the esteemed Commodore Sir Charles Douglas arrived back at Spithead from the Leeward Islands where he had been captain of the fleet to Admiral Hugh Pigot, the position from which he had exerted great influence upon that officer’s predecessor as commander-in-chief, Admiral Sir George Rodney, at the Battle of the Saintes fifteen months earlier. Yet if Sir Charles was looking forward to some rest after a long war that had began personally with his attempt to relieve the besieged Quebec eight long years previously, then he had reckoned without the requirements of the Admiralty, for just three months after stepping ashore he found himself treading the quarterdeck of a man-of-war once more. This time he was aboard the Assistance 50, Captain William Bentinck, which departed Portsmouth on 17 October in the company of the frigate Hermione 32, Captain John Stone, in passage for Halifax, Nova Scotia where Douglas was to take up his new post as the commander-in-chief of the North American station. From the very beginning of this appointment things did not go well for Sir Charles. The weather on the voyage out to Nova Scotia was so appalling that the two ships were unable to reach Halifax, and instead had to put in to Sandy Hook near New York. Here, disastrously, the Assistance’s first lieutenant, Hon. Hamilton Douglas Haliburton, along with the lieutenant of marines, ten midshipmen and three seamen, froze to death in a blizzard when searching for three deserters who had taken their chance to escape ashore. Then wary that his ships might be blocked in by the ice on what was now an unfriendly continent, and knowing that supplies and provisions would be hard to come by, Douglas decided to winter in the Caribbean. Upon his reaching the West Indies the inhabitants of Barbados were delighted to welcome the hero of the Battle of the Saintes, which victorious engagement had preserved the Leeward Islands from French occupation. Similarly the commodore and his wife, Lady Douglas, were well received at Dominica, Antigua, Montserrat, Nevis and St. Kitts. Yet already there were mutterings that rather than taking a triumphant tour of adulation through the Caribbean Douglas should have been doing more to take up his position at Nova Scotia, and it was not until 29 May 1784 that he finally arrived at Halifax and got down to work. The traditional responsibilities of the commander-in-chief at Halifax had been supplemented by the requirement to implement the recent Treaty of Paris with the newly independent United States, and to provide transports and assist in the settling of loyalist families who had relocated from the colonies. He also now had to protect Nova Scotia waters from American fishing vessels, and to prevent American whalers from collecting wood for their furnaces, and to stop the illicit mining of coal, both by Americans and by the locals. One of Douglas’ greatest difficulties would be attempting to balance the polarity in views relating to trade with the United States, for whilst some wished to have nothing to do with the ex-colonies and were determined to see them suffer financially, others realised that Britain’s remaining North American territories could not subsist without the importation of goods from the United States. Thus he soon found himself in the invidious position of sending men-of-war to the Bay of Fundy to prevent illicit trade with the Americans, whilst at the same time allowing their traders, with the compliance of the Nova Scotia governor and assembly, to freely unload their goods at Halifax. In this matter he was little helped by the Admiralty, which seemed unable to provide him with any useful guidance. However, in respect of his decision to appoint three loyalist chaplains from the former colonies in North America to the Hermione, Resource 28, Captain Paul Minchin, and Ariadne 20, Captain Samuel Osborn, the Admiralty’s stance was far more emphatic. Although these appointments appeared to be perfectly in accordance with legislation that stated every ship with a complement in excess of a hundred men could have a chaplin, the Admiralty rushed off instructions, together with what Sir Charles deemed to be an unnecessary admonishment, demanding that he immediately discharge the clergymen. This was a command that appeared to perturb Douglas immensely, and which caused him to consider his position. In the meantime he had also fallen out with the Admiralty over his frustration in having no influence over the improvements he considered were necessary to the dockyard at Halifax, this facility being the responsibility of the naval commissioner, Henry Duncan. At the time Halifax was only able to harbour a 50-gun ship, three frigates, three sloops and a brig, and having lost the use of so many ports on the American coast it was an obvious requirement that Halifax be improved. 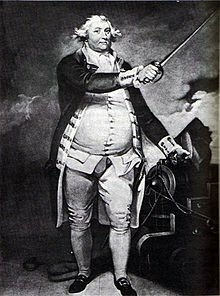 Then to cap it all Douglas formed a disagreement with one of Duncan’s subordinates, a young man by the name of George Thomas, who although only the navy yard’s storekeeper also happened to be the illegitimate son of Vice-Admiral Sir Hugh Palliser. When the disagreement reached its zenith Douglas arbitrarily replaced Thomas with his own man in Duncan’s absence. Such interference was most irregular, and again the Admiralty condemned Douglas. Given the many controversies it was no surprise that Douglas asked for a recall in November 1784, and it was no surprise that the request was immediately acceded to by the Admiralty. Having left Halifax Sir Charles returned to England aboard the Hermione towards the end of August 1785, and he was replaced as the commander-in-chief of the North American station by Commodore Herbert Sawyer.